St Andrew’s Church green gate bank – nettles are again pulled and tree shoots trimmed off before scything and tidying. The grass now grows right up to the wall. 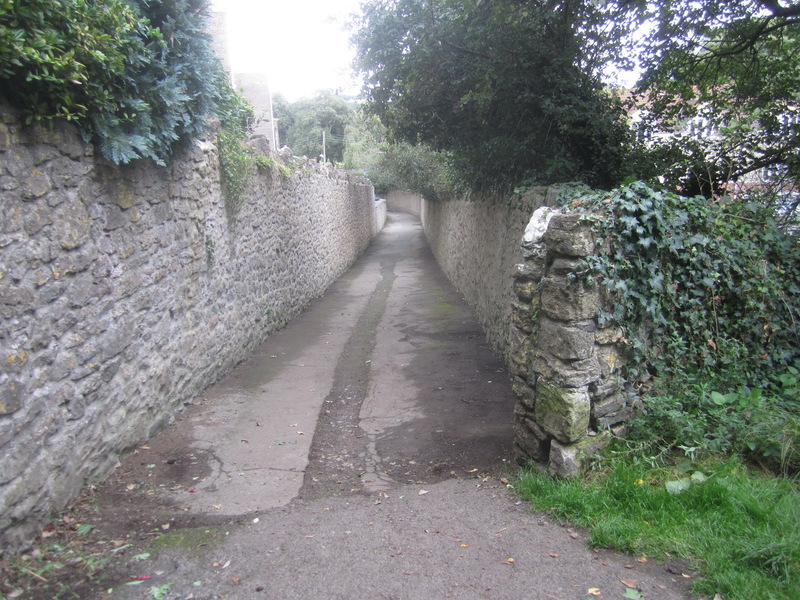 The costal path is regularly and thoroughly tidied – here beside the Glebe field. The final volunteer session to combat flowering wild radish on Church Hill. Later in the month the hillside will be mechanically mown and arisings baled by the farmer contractor. The annual ragwort pull on Wain’s Hill. Quite a crop this year, but little on Church Hill. The steps leading to Salthouse Wood and paths above Marine Lake are weeded and swept. Summer mowing starts on the Wain’s Hill ramparts. The steep and stoney north-east end has been mown with a brush-cutter this year. Arisings are raked off after being left to dry for a few days, and left as habitat piles in the woodland at the bottom of the slope. 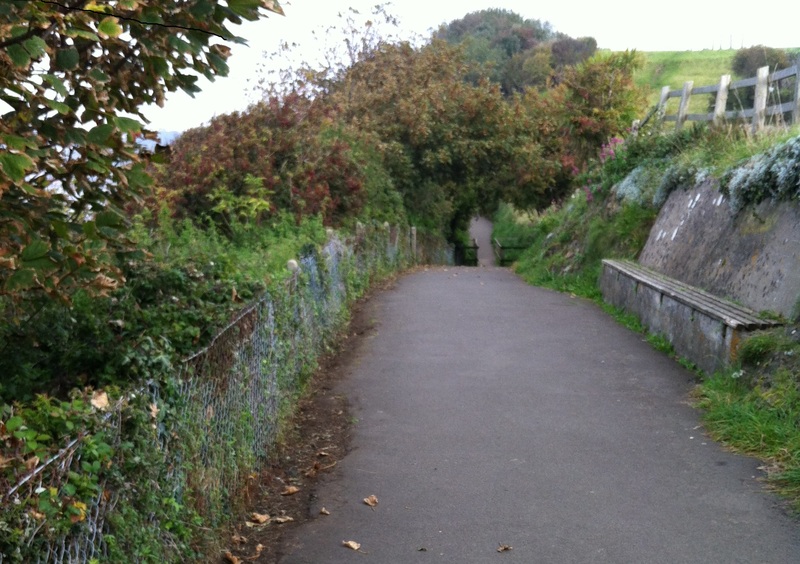 Church Hill – the zigzag steps and the path above are cleared of overgrown vegetation. Control of invasive wild radish continues on Church Hill by scything and grubbing out with mattocks. Smaller, isolated plants can be removed from the grassland with a ragfork. Bramble crowns are grubbed out and more debris is removed from the view point beside the old battery site on Wain’s Hill. A second iron ring is discovered. Church Hill – wild radish has invaded grassland over recent years and must be controlled. Self-seeded hawthorn is cleared from the Victorian gun battery site on Wain’s Hill and more nettles, stumps and accumulated soil are shovelled off to expose the concrete base. Work at Wain’s Hill old gun battery site continues by removing bramble roots, nettles, tree stumps and accumulated soil from the concrete base where the cannon originally stood. Church Hill woodland is improved by clearing a few remaining brambles and feral raspberries. Non-native daffodils, introduced years ago, are left to provide spring colour. Improving a thicket habitat on Church Hill – the height of scrub trees is reduced to promote bushier growth and reduce wind damage. Self-seeded sycamore saplings are removed from a thicket area on Church Hill to prevent them from competing for light and space with native elder, hawthorn and blackthorn. As an early contribution towards the national Clean for the Queen event (to be held 5th March) the Friends have tidied and swept two access paths to Clevedon’s Marine Lake, adjacent to Poets’ Walk. Church Hill – tidying a partly fallen tree above Hack’s Way, and pruning an old and spreading buddleia to reduce its height and to promote fresh growth. Elder is trimmed back to expose the Poets’ Walk sign in Salthouse Road. A Church Hill grassland slope is further improved by pulling and grubbing out young brambles and cutting regrowth from tree stumps. A build up of autumn leaves and mud is cleared from the path to Wain’s Hill while nettles and other invasive species are cleared back from the junction to the zigzag path. Scything of the Wain’s Hill ramparts is completed during October. The bank at the NE end, as well as the nearby path edge, is also cut to control scrub regrowth. Two steep slopes on Church Hill, as well as the view point above the zigzag path, are scythed and the arisings raked off to improve the quality of the grassland. The Friends’ 4th anniversary was celebrated on two Thursdays this year!